Modern day magicians like David Blaine and Criss Angel have taken the art of illusion to the next level, and are now being mentioned in the same sentences as guys with names like Copperfield and Houdini. Unfortunately, since a magician never reveals his secrets, you're out of luck if you're wondering how these masters of illusion work their magic. The secrets behind the seemingly magic qualities of high efficiency replacement windows, however, aren't so closely guarded. Here's our spring replacement window primer if you're looking to pull some high efficiency replacement windows out of your hat this spring. Online consumer advocate Toolbase Services points out that anywhere from 25% to 50% of the heat loss in an average home can be attributed to inefficient windows. According to the U.S. Department of Energy's Energy Star website, homeowners can save as much as $600 a year or more on heating and cooling costs by replacing older windows with new high efficiency models. The U.S. Department of Energy's EERE website points out that reduced heating and cooling costs are just the tip of the iceberg when it comes to the benefits of high efficiency windows. 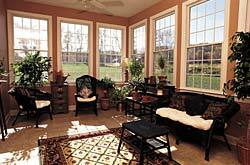 High efficiency windows also reduce solar heat gain, protect furniture, carpet, and wall coverings from damaging U.V. rays, and they can reduce your reliance on artificial lighting during the day, lowering your energy costs even more. What's the Secret to Today's Energy Efficient Windows? Just what makes energy efficient windows so magical? In fact, it's a long list of secrets and magic tricks working together that make such a dramatic difference. At the risk of violating the magician's oath, here are things that you need to consider when you start shopping around. Secret CompartmentsHiding a rabbit in a top hat is child's play when you compare it to what energy efficient windows have up their sleeves. Gas fills, multiple panes, extra insulative films, and insulated window frames are all examples of the secret compartments on high efficiency windows that can make your energy bill woes vanish faster than you can say "Abracadabra!" Now You See It, Now You Don'tMaking things disappear has always been the cornerstone of a good magic act. That said, invisible low e-coatings and solar control coatings have been the best thing to happen to windows and energy efficiency since the invention of glass, and are a critical addition if you expect your new replacement windows to perform at the highest level. Foiling Escape Artists by Sealing Up the Rest of Your HomeGood windows are important, but Alan J. Heavens of the Philadelphia Enquirer warns that no window has enough magic to fix a home that has energy efficiency issues that reach beyond the window frames. "Remember," writes Heavens, "you can spend thousands of dollars (on windows) and your house may still be as drafty as it was beforeexcept when you stand in front of the windows. We often blame windows for our energy problems, but much heat is lost in the space around them." In short, for optimal results when it comes to improving your home's energy efficiency, make sure that your new replacement windows are part of a larger whole house plan to go green. Few home improvements have the potential to steal the show and make a bigger impact that new high efficiency replacement windows. If you're looking to put on a little magic act of your own, you owe it to yourself to bump replacement windows to the top of your to-do list this spring.